For me, the best thing about Election Day 2018 was the passage of Constitutional Amendment 9. But that will not be the end of it. Now it is the job of the state legislature to implement the amendment and for us to keep watch that they do. Basically, this means that the language that makes up the ballot amendment must be put into the Florida Constitution and “implemented,” or fulfilled. 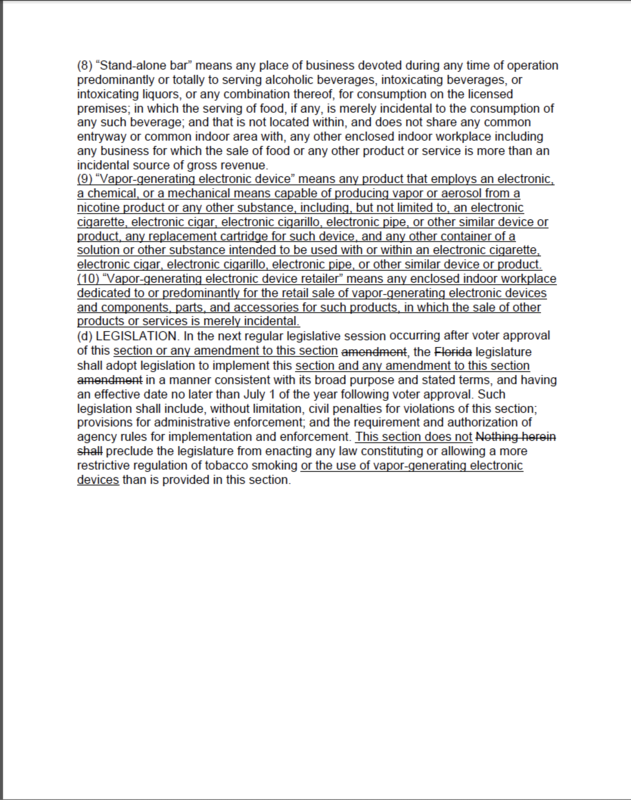 To be “implemented” the ballot language that composes the amendment must be inserted and followed. 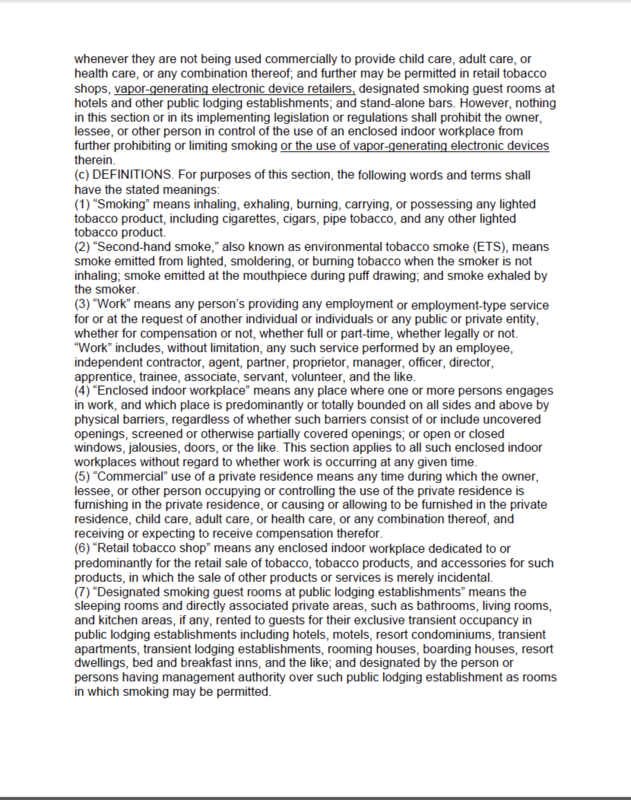 Amendment 9 was made up of two parts. 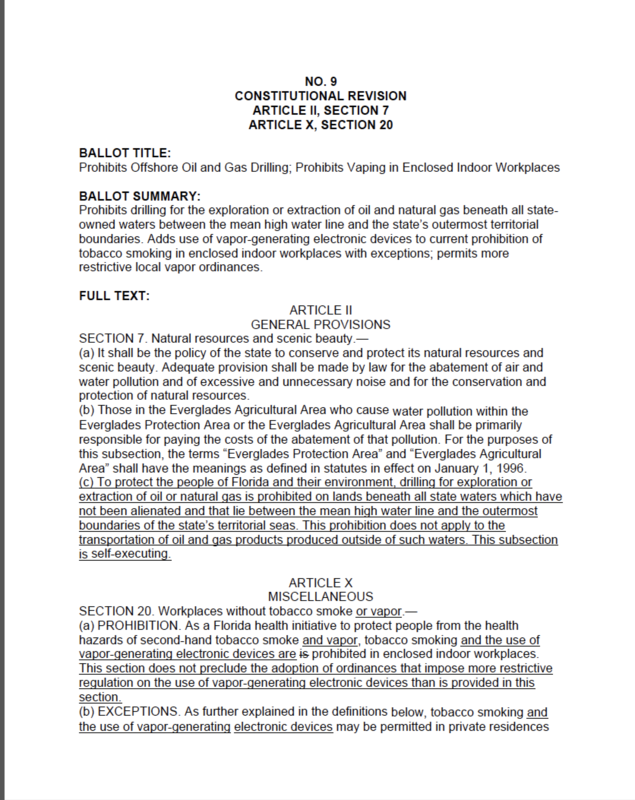 During the Constitution Revision Commission process, I had sponsored Proposal #91 Prohibiting Offshore Oil and Gas Drilling, and Commissioner Lisa Carlton had sponsored Proposal #65 Prohibits Vaping in Enclosed Indoors Workplaces. 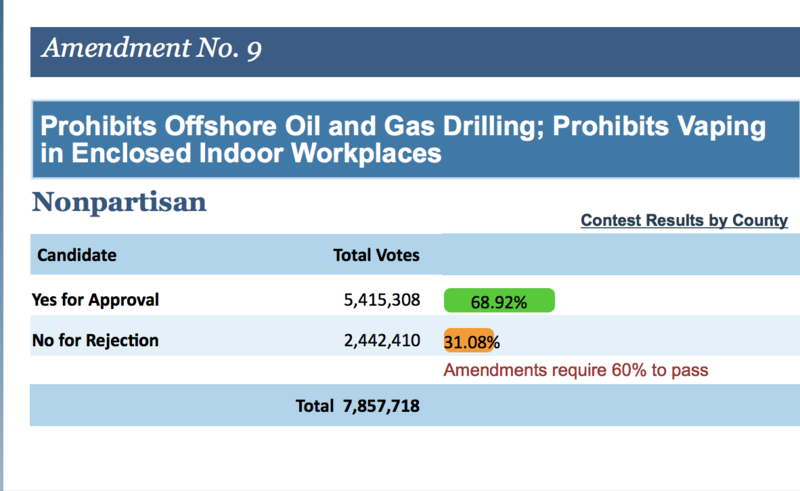 These two proposals made it through the arduous CRC committee process and then were “bundled” by the CRC Style and Drafting Committee relating as “Clean Air and Clean Water.” Thus on the ballot, married, what were P#91 and P#65 composed a new whole: Amendment 9 ~ Prohibiting Offshore Oil and Gas Drilling; Prohibits Vaping in Enclosed Indoors Workplaces. As everyone who followed the election knows, the #RoadToTheBallot wasn’t easy, and Amendment 9 was criticized unmercifully by the press, and even went before the Florida Supreme Court. In the end, the court supported the bundling and the people of Florida did too. The voters read, studied, and decided for themselves, Clean Air and Clean Water in Florida is very, very important. The required 60% passage was exceeded; the amendment passed by 68.92%! The people have spoken and now the state Legislature must do its work and implement the amendment by placing the ballot language into the Florida Constitution. See the language that comes off the Florida Division of Elections website below. 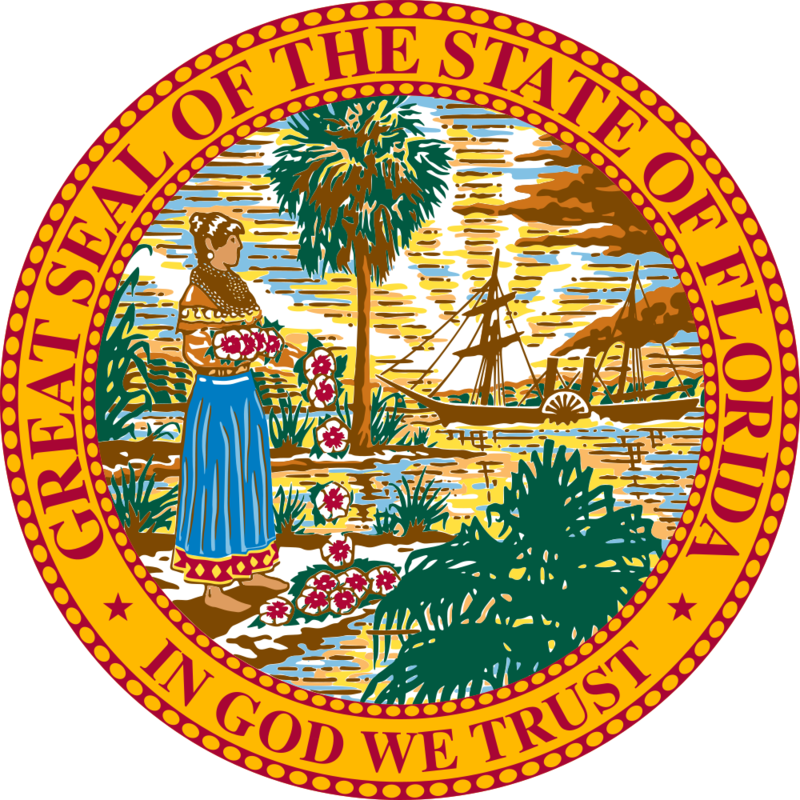 There have been times in the past, as with Amendment 1 2014, Florida’s Water and Land Conservation Initiative, where the state legislature did not follow the intent of the language once it was in the constitution. They interpreted it rather to benefit the state power structure. Some say this is partially because the language was vague and a court case was brought to try to clear up the amendment’s interpretation by the state legislature. Read this article below to see why…. What do they say? “Power tends to corrupt and absolute power corrupts absolutely….” And who is the most powerful of all? The State Legislature!